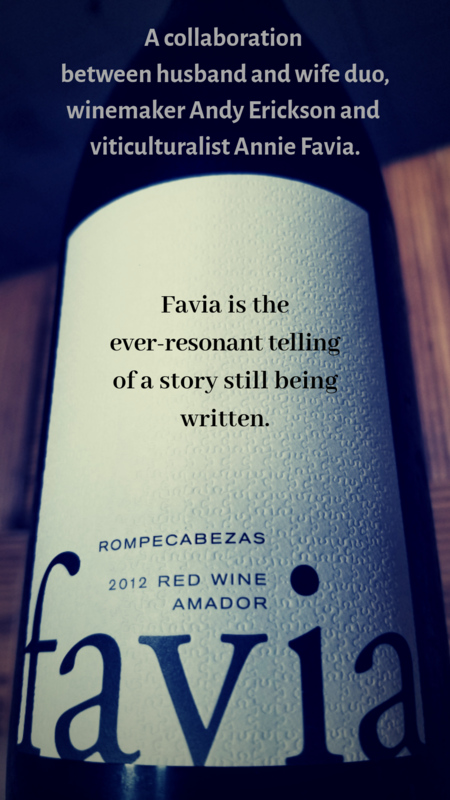 Favia Erickson Winegrowers is first a collaboration between husband and wife duo winemaker Andy Erickson and viticulturalist Annie Favia. Rompecabezas Red Wine Spanish for “jig-saw puzzle”, Rompecabezas is inspired by the wines of the Southern Rhone, but of course is decidedly Californian in nature. With each successive vintage, the wine has gained density and complexity, as the vines come into their own, and Ann Kraemer’s vineyard team garners perspective and foresight. Whole cluster, rich, muscular Grenache, with notes of cocoa, leather, and black tea, was co-fermented with fresh, vibrant Mourvèdre in concrete fermenters. After a long, controlled maceration, the wine was blended with Syrah and aged in a combination of neutral French oak and 600-liter concrete eggs for 20 months. 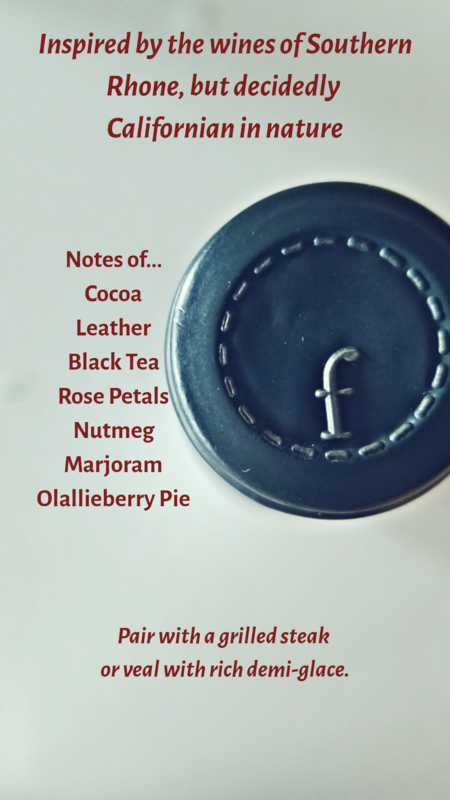 Darkly colored and highly aromatic, notes of olallieberry pie, rose petals, nutmeg and marjoram emanate from the glass. The flavors are mouthwateringly appealing, with fine tannins and vibrant natural acidity, bringing notes of Bing cherries, finocchiona salumi, dark plums and toasted Hungarian paprika. Certainly, a pleasantly complex puzzle of flavors and textures, with incredible focus on the palate. The “jigsaw puzzle” is a perfect profile and homage to a Rhône blend. With Mourvèdre being at the forefront, the floral characters, earthy components and structure are beautiful with gripping tannin. The Grenache shines through with an abundance of ripe red fruit, plush texture and silky mouthfeel. 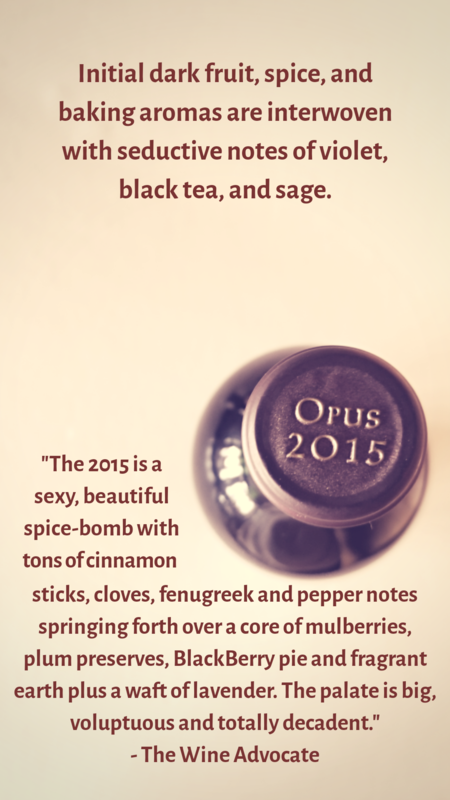 The Syrah shows restraint with its dark fruit flavors and savory, spicy and earthy notes. This New World example is fruit-forward in style, masculine and can definitely make you a lot of friends! This wine can work with a wide variety of meat-based dishes, with lamb and game being at the front of the line. A grilled steak, or veal with a rich demi-glace would also be an amazing combination. Opus One Winery is a winery in Oakville, California, United States. 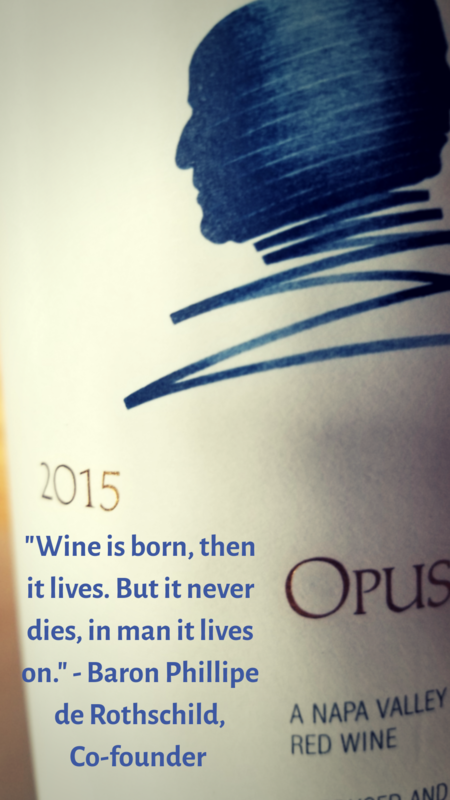 The wine was called Napa-Medoc until 1982 when it was named Opus One. 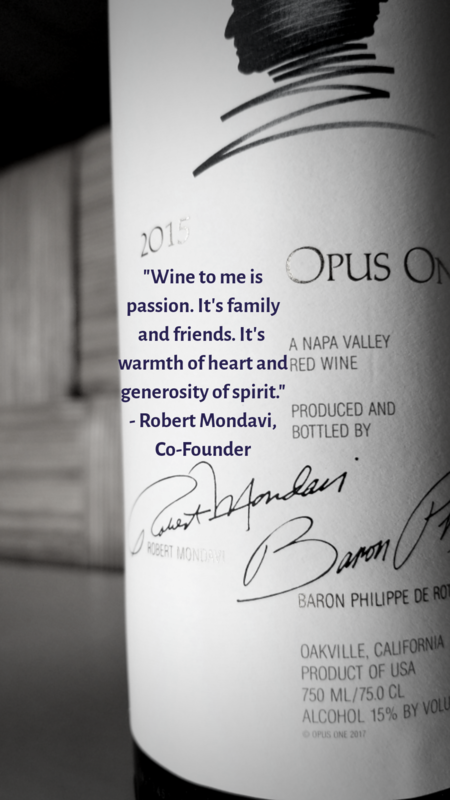 The winery was founded as a joint venture between Baron Philippe de Rothschild of Château Mouton Rothschild and Robert Mondavi to create a single Bordeaux style blend based upon Napa Valley Cabernet Sauvignon. The creation of this winery venture in 1980 was big news in the wine industry; de Rothschild's involvement added an air of respectability to the burgeoning Napa wine region. The first vintage, 1979 was released in 1984 at the same time as the 1980 vintage. In 1989 a new winery was built just down the road, the first vintage from the new winery was from 1991 and was released in 1994. Cabernet-based, Left-Bank-styled wines are typically more tannic and structured, while Merlot-based wines modeled after the Right Bank are softer and suppler. Cabernet Franc can add herbal notes, while Malbec and Petit Verdot contribute color and structure. Wines from Bordeaux lean towards a highly structured and earthy style whereas New World areas (as in the ones named above) tend to produce bold and fruit-forward blends. Either way, Bordeaux red blends generally have aromas and flavors of black currant, cedar, plum, graphite, and violet, with more red fruit flavors when Merlot makes up a high proportion of the blend. Since Bordeaux red blends are often quite structured and tannic, they pair best with hearty, flavorful and fatty meat dishes. Any type of steak makes for a classic pairing. Equally welcome with these wines would be beef brisket, pot roast, braised lamb or smoked duck. 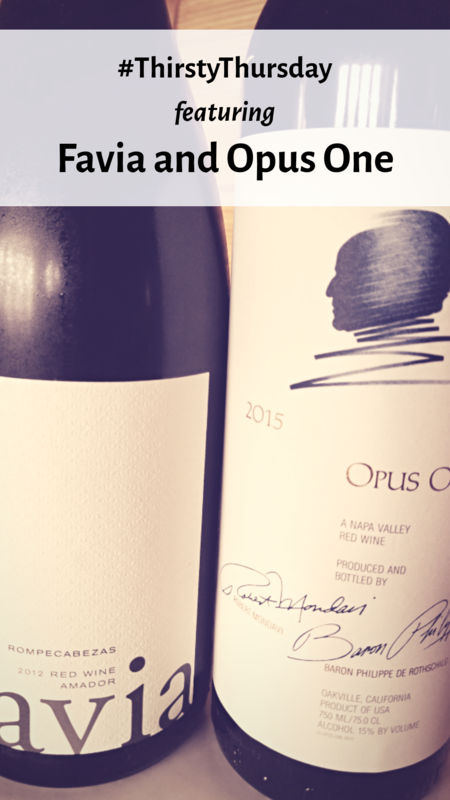 Come in and try the Opus One 2015 by the bottle or by the glass!